Scooby Doo is an animated cartoon of almost iconic levels. The hit cartoon show has had a successful run for many years, and it still seems to be going strong with spin-offs into big screen movies and telecasts. Scooby and his mystery-loving team have a lot of history. Prepare to be enlightened, at least on the funny stuff. Scooby Doo was almost created as a shaggy sheep dog rather than the lumbering Great Dane he came to be. Makers first had to decide whether Scooby was a small little scrapper or a big cowardly pup. They went for big, and then it was a toss up between a Great Dane and a shaggy sheep dog. Great Dane won, and Scooby Doo was born. However, his name almost wasn't Scooby; his original character's name started out as Too Much. Scooby defies traditional Great Dane characteristics. Scooby wound up with a double chin, a sway back and extremely bowed legs. A traditional Great Dane is much more solidly built, with a straight back, straight legs and very little extra body fat. Scooby isn't Scooby's full name! 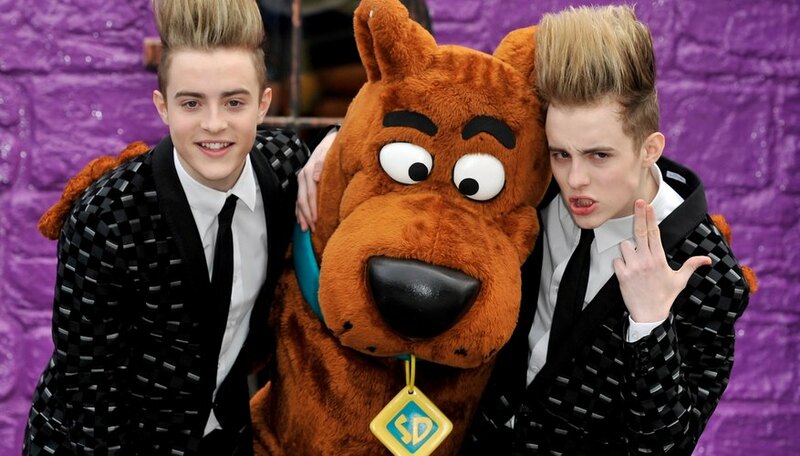 It's really Scoobert "Scooby" Doo. In dog years, he is a whopping 280 years old. That translates to 40 in human years, which still makes Scooby a bit old by kid standards. Luckily, Scooby is a kid and a chicken at heart. Adult and child viewers alike still adore him. Scooby has quite the family. He has his pint-sized nephew Scrappy Doo, who made his first appearance on the show in 1979. He also has a half-wit cousin who goes by the name of Scooby-Dum, from the Hokefenokee swamp lands. There is also his extended family in the Mystery Inc. team, but you already know about that. Who says dogs aren't people? You can buy your own caramel-flavored Scooby Snacks. Scooby Doo is fanatical about his treats, and you can get some for you or your own pet at your local grocery store. Yes, they actually taste good! By the way, his good friend Shaggy is a vegetarian. Every meal he's eaten on the show has been meatless. Scooby isn't finished yet. Scooby recently released a live action movie called Scooby Doo: The Mystery Begin's, chronicling the Mystery Inc. teams first ever collaboration together. The movie did so well that it looks like a sequel may be in the works, with a possible series of live action telecasts chronicling some of Scooby's most exciting escapades. 280-year-old Scooby Doo is moving full steam ahead!